Atlantic RecordsBruno Mars, Gucci Mane and Kodak Black channel Superfly in their “Wake Up in the Sky” video, which was just released today. 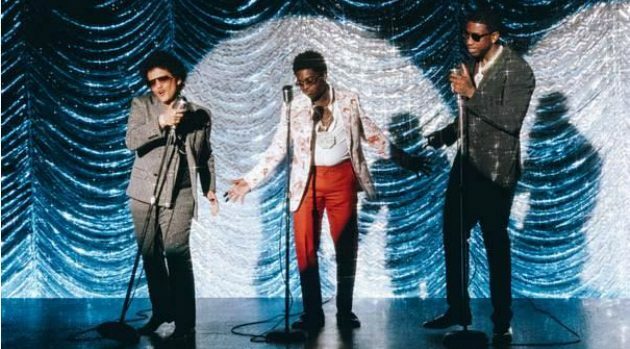 Bruno, who co-produced the song and directed the clip, sings in the chorus, “I know I’m Superfly,” and all three artists play the role, dripping in diamonds. Gucci is the most extravagant, wearing an all-white, full-length fur coat, as he admires himself in three mirrors simultaneously. The trio also performs onstage as an ’80s R&B vocal group, with old-school choreography. The video ends with a champagne toast as Bruno and the two rappers party onstage surrounded by ladies. “Wake Up in the Sky” is Gucci’s latest single, and is expected to be included on his 13th studio album, Evil Genus, which he plans to drop in December.